Since I posted about the Death & Taxes chart, 2 more political graphics have caught my eye. The first one was actually put out by The White House, comparing the proposals in Pres. Obama's Jobs Act to the consequences of the GOP's plan. I'm no mindless Obama drone, but I think he's clearly a helluva lot better than Dubya was. If you watch speeches by the 2 presidents & you still think Obama's the worse one, then you've got problems. Obama's not nearly progressive enough for me, but I would much rather have him stay office than ANY one of the Republican candidates... even that half-genius/half-idiot Ron Paul. Some critics would argue that this chart's just another piece of Obama Marxist propoganda, but it seems to correlate w/ the news I've been seeing coming out of Congress. People could use more graphics like this that outline policy differences in a clear way, as long as they are accurate. Capital has its rights, which are as worthy of protection as any other rights." I would take issued with the last line of the quote in the text, though. I don't think that an conceptual tool like 'capital' should be considered to have rights at all, as individuals or groups of people do. ...that's like saying that computer software has rights. 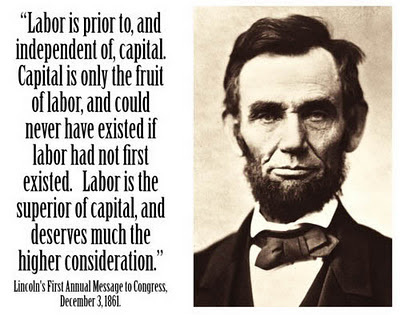 It could also be argued that capital can be created from sources not normally considered "labor". The creation of intellectual property can be considered a form of labor, if it leads to further production of goods & services. What is definitely NOT productive labor? Financial schemes that do nothing but extract value from the economy, for the benefit of manipulative firms & their executives. I felt like doing something EXTRA-exciting, so I was watching a history lecture on C-SPAN. The lecture was by Professor Stephen Ortiz of Binghamton University. The topic was New Deal programs & the Roosevelt administration. There was an excerpt played of this speech at Madison Sq. Garden by Roosevelt a little more than 75 years ago. President Obama's political instinct is to continually attempt compromise with the Republican party & corporate America. "We had to struggle with the old enemies of peace--business and financial monopoly, speculation, reckless banking, class antagonism, sectionalism, war profiteering. People love to complain about the government, Wall St. & how "The System" as a whole is corrupt. When people actually get out, organize, & try to do something about it, there are inevitably critics who feel like the status quo is better than actually trying to make major changes. I think the Occupy protests are, overall, an effective force to initiate social and political change. I'm old enough to fondly remember the massive Iraq War protests during the Bush Dark Ages. 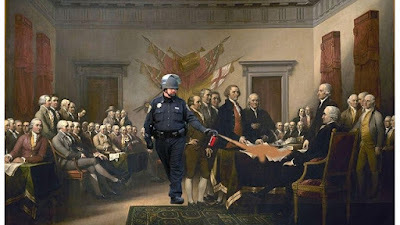 The broad, sustained nature of the current Occupy protests are now having a large impact on the nation & the world. The basic ideals that the people want to address are: democracy, justice, & freedom from oppression in it's many forms. Most people don't expect a free ride in life, but we should all expect to have some protection against being exploited or preyed upon. So, it's very disturbing to see the bizarro world we live in- where the forces that are supposed to protect the people are violently used against peaceful citizens & students who are trying to assert their rights as citizens and human beings. Why are the victims (The protesting, debt-saddled American people) being criminalized instead of the perpetrators- (the financial & corporate players who have defrauded the country)? To have any credibility with people interested in the nation-wide movement, President Obama needs to emphatically condemn violence against peaceful protesters. He's publicly sympathized with the sentiments of the protesters, even if he is a partial Wall St. beneficiary. Regardless, he should take action, or at least speak out, to prevent this kind of extreme assholery. It should not be tolerated from any law enforcement in this country, especially against unarmed students & innocent civilians. This officer is basically a grown-up version of South Park's Eric Cartman- "Respect Mah Authoritah!!!!!" Later on, the chancellor of the school finally emerged to a creepy walk of shame by a silent mass of students staring her down. Life & biology are sources of endless amazement. Being a visual artist, the form and function of the eye, in particular, is something I find fascinating. 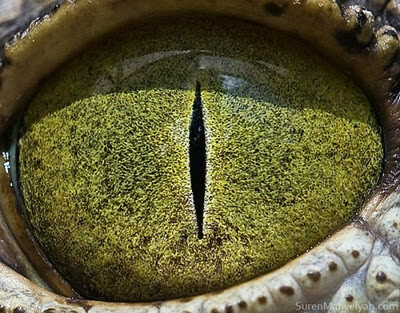 I saw this link on Neatorama to a cool set of close-up photos of eyes from the animal kingdom. This cartoon I saw on Neatorama is a funny look at the nagging sense of "sooo much to do!" that most people experience on a daily basis, but especially professionals or creative people. 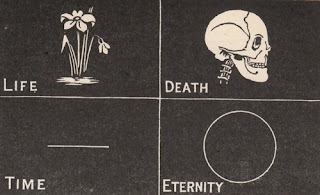 My last post was about the inevitability of Death, too... but I'm not trying to be macabre. 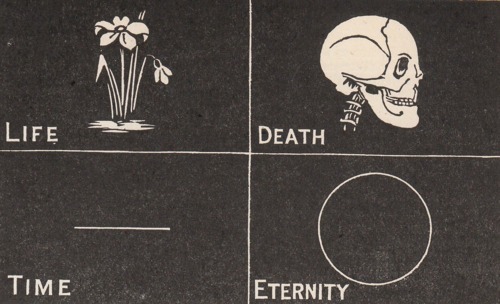 Being constantly aware of one's own mortality is simply the most effective way to appreciate Life. I truly enjoy life & have been fortunate to have a very productive career as a graphic artist. However, there are always projects or visual art that I'm thinking of continually but just don't have time to even start. Although I sometimes sketch or write down ideas, most of them are archived in my head until I get to it. Despite the constant urge to create, I try to remember there's no way to do everything I'd like. Therefore we sometimes have to stop, try to calm the whirlwind inside our head, put things in perspective, & take time to breath while we can. Whether or not it's all just a last spasm of brain activity, I always try to remember to make it count. We only have one shot at this life, and we waste so much of it... all we can do is live it up the best we can. I've posted before about the Civilian Conservation Corps, a government program in the 1930's-40's that created work for Americans in meaningful public projects. 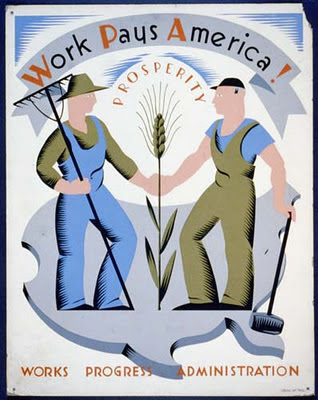 Sen. Lautenberg from my home state of NJ has proposed a modern Works Progress Administration or WPA, which was another New Deal initiative by Franklin Roosevelt. This is the kind of government intervention that should have been implemented awhile ago, instead of shoveling taxpayer money into The Great Casino on Wall St. I enjoy taking photos, for personal events & also for art's sake. Much of our memories, especially of the distant past, are facilitated by old photographs. I've got alot of photos from the days of film, but since the era of digital cameras the ability to take pics is relatively unlimited. 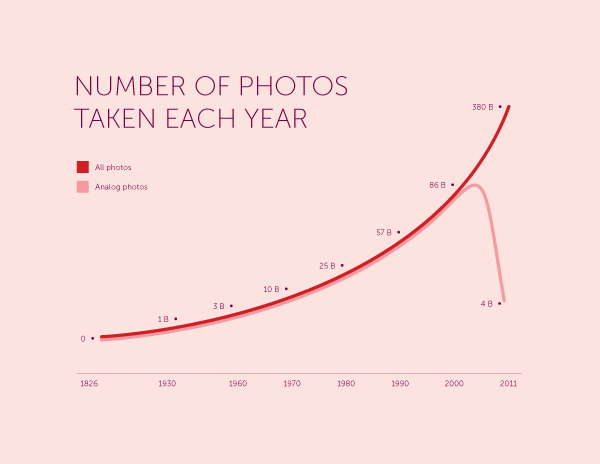 Here is a calculation of the total number of photos that have been taken. 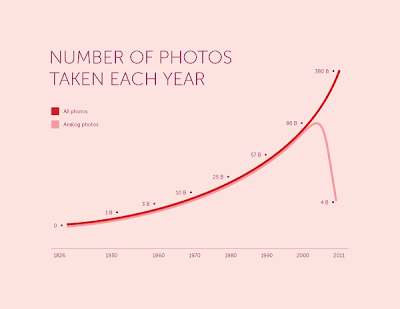 The total estimated number, 3.5 trillion photos, is probably going to be dwarfed in no time. How Many Photos Have Ever Been Taken? Of course, there is also the digital wonder of Youtube, which is also increasing its archive of videos at an exponential rate. The total library is constantly growing which makes it tough to precisely calculate at any one time. We are creating an ethereal repository of human experience. As long as the digital network (or its futuristic offshoot) is functioning, mankind's memories will remain intact. Ultimately, all this information is nothing but light. However, as long as all our data needs to be stored in physical drives or servers, it's always susceptible to cataclysms in the physical world. Eventually, when we are each inevitably implanted with an Apple iThink, our lives will be continually recorded from one or multiple perspectives, perhaps in true 3-D using holographic data. This is a great interactive graphic that is updated each year by designer Jess Bachman. It's a clear visual representation of how the US federal budget is allocated & makes it easier to visualize where our tax money is spent. There's a full screen button for easier viewing. I've talked before about the Occupy Wall St. protests. Personally, as long as it remains generally non-violent I think the overall goals are eminently reasonable & are helping to guide the national discussion toward relevant issues. Of course, nothing is sacred when it comes to the satirical genius of Stephen Colbert. This segment was really unfair to the motivations of the movement, but it's hysterical. He demonstrated the power of absurdity & cynicism to these young idealists- by expertly playing the part of the self-absorbed, plutocratic a-hole.